Summer is finally winding down. As we transition to spending more time indoors, it’s easy to let our skincare routines slip a bit. But there’s still plenty of sun out there. Even if all the time you spend “outside” in the fall and winter is in your car, UV rays can still penetrate the windows. So you’ll want to make sure you’re protected. Fortunately, adding one simple step to your morning routine can protect your skin from free radicals, UV rays, and even irregular pigmentation. About six weeks ago, Kathy sent me a text. All it said was “THANK YOU!! !” Kathy is a 58-year-old patient of mine. She’s also recovering from breast cancer treatment. We usually reserve adjectives like “glowing” for healthy women in their 20s. But I can’t think of a better word to describe Kathy's skin. Kathy told me that she had tried bags full of expensive creams from department stores. But after her cancer treatment, she had two requirements. She wanted to use just one product. And she wanted it to be free of chemicals. In fact, it was critical that she NOT add any chemicals into her body. There was one product that could rise to the challenge…. Although Kathy wanted just one product, she was willing to use it twice a day consistently. Sure enough, after six weeks, the quality and appearance of her skin had improved dramatically. Using it twice a day was an important factor in her success. Of course, using a product like the Systeme 41 Vitamin C Serum was important too. Many people save products like serums for the evening. But by applying the serum in the morning, Kathy was protecting her face from the free radicals and air pollution that assault our faces all day. Then, in the evening, it could focus on the repair and restoration work her skin needed after her cancer battle. Because vitamin C is both the most abundant antioxidant in the skin and quite powerful, researchers have studied it pretty extensively. They’ve found that most plants and animals can actually make their own vitamin C. They synthesize it from glucose. Humans, however, can’t do this. We’re missing a key enzyme for this process. So we have to get vitamin C from outside sources. Given its abundance in delicious foods like citrus fruits, strawberries, and papaya, I’m not complaining! And, as you know, vitamin C is a great immune-system booster, so we do want to make sure we’re eating plenty of these foods. Nevertheless, while consuming vitamin C is certainly great for your overall health, only a small amount makes it to the skin. So to truly reap its benefits for your complexion, you’ll need to apply it topically as well. And there are quite a few benefits to reap. First, vitamin C is a formidable enemy to oxidative stress. When we encounter pollution, smoke, UV rays, or other damaging environmental factors, free radicals form in the skin. 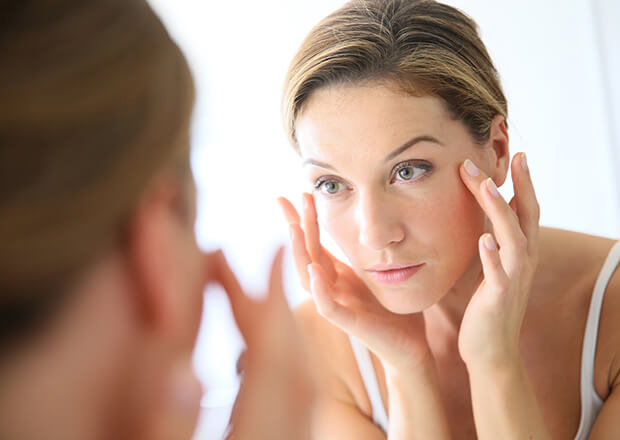 These erratic molecules wreak havoc, damaging proteins, cell membranes, and even our DNA, resulting visually in wrinkles, larger pores, and general dullness. UV rays are one of the worst sources of oxidative stress. They contribute to dark spots, wrinkles, and even skin cancer. And they trigger a chain reaction that promotes the production of matrix metalloproteinases (MMPs). MMPs break down collagen and keep the body from making more. Vitamin C blocks a step from occurring in that chain reaction that produces MMP. This helps protect collagen. And more collagen means fewer wrinkles. A double-blind placebo-controlled study found that using a 10% vitamin C product for 12 weeks led to a statistically significant improvement in wrinkles for the participants. Of course, sunscreen is an important part of a UV defense strategy. But no sunscreen will block every UV ray from reaching your skin. In fact, sunscreen cuts the free radicals UV exposure produces in the skin only by about 55%. That’s a good start. But it still leaves a lot of potential for damage. Vitamin C provides an excellent second line of defense. It works against both UVA and UVB rays. UVA rays are a major cause of skin aging and melanoma. UVB rays take credit for sunburns, free radicals, epidermal mutations, and other types of skin cancer. One study found that a 10% vitamin C topical product could reduce sunburn cell formation by up to 60%. One of the biggest concerns related to UV exposure is certainly skin cancer. By reducing oxidative stress, vitamin C helps prevent the mutations that can trigger cancer growth. Certain free radicals that develop from UV radiation create genetic mutations that keep cells from repairing DNA. Plus, they signal the apoptosis (cell death) process to start. Clinical studies have found that vitamin C can greatly reduce the activity of these free radicals, providing significant protection to the skin. With the skin safe and healthy, vitamin C can move on to helping to rebuild and restore. In particular, the skin relies on vitamin C to make new collagen. Plus, the skin uses this vitamin to help link and stabilize the fibers that keep collagen strong and supple. 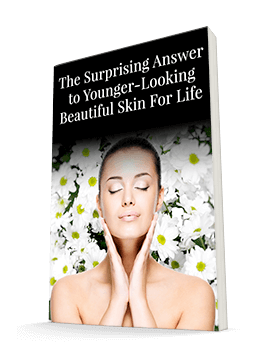 This also reduces sagging and wrinkles to keep the skin looking youthful. In fact, in one study, researchers exposed human skin fibroblasts to vitamin C. In these skin cells, collagen synthesis didn’t just double. It didn’t just triple. It actually increased by about eight-fold. And it did this without any major changes in other proteins where an increase would be unnecessary. While vitamin C is clearly a superstar, vitamin E is great for the skin as well. It keeps cell membranes safe from free radicals and supports collagen as well. However, it’s also highly sensitive to UV radiation. Vitamin C helps to protect and replenish it. Together, the two then have a synergistic effect on the health of the skin, especially the collagen network. Research has even found that vitamin E helps vitamin C work four times more effectively. Of course, even if you have smooth, firm, youthful-looking collagen, dark spots and other forms of hyperpigmentation can age you. But vitamin C can help with this too. Vitamin C blocks an enzyme called tyrosinase. This enzyme is responsible for turning tyrosine into melanin. And excess melanin is the culprit behind those dark spots. A clinical study found that topical application of vitamin C could decrease melasma, hyperpigmentation that often occurs during pregnancy or after UV exposure, as well. Thanks to all these benefits, vitamin C works quickly to improve your complexion. Like Kathy, you should notice that your skin looks younger, brighter, and tighter if you use it twice a day for six weeks. Kathy only wanted to use one product, and I can’t blame her. But I really prefer a three-step morning and evening routine. Start with a vitamin C product, like a serum. Free radicals will be assaulting your face all day. Even if you’re indoors, UV rays can penetrate windows. And toxins in the air create oxidative stress as well. Vitamin C provides needed protection. Next comes a moisturizer. Healthier skin will be better prepared to absorb and retain moisture, keeping you looking fresh all day. Finally, top it all off with sunscreen – again, even if you’ll be indoors. I prefer natural sunscreens relying primarily on zinc. This helps provide a physical barrier to keep UV rays from reaching the skin. But if any do slip through, the vitamin C will be there to quickly neutralize any free radicals. Many of my patients wonder if vitamin C will work for them like it did for Kathy. The remarkable thing about vitamin C is that it works for oily, dry, and combination skin. No matter what category you fall into, your skin can benefit. For the Système 41 Vitamin C Serum, we used water- and oil-soluble vitamin C. This combination of oil and water vitamin C is unique. It helps the serum function even more effectively. Finally, you may have heard that vitamin C is sensitive to light or air. Both are true, so you need to look for products packaged with this in mind. The Système 41 Vitamin C Serum comes in a dark glass bottle. This protects it from light deterioration as well as exposure to oxygen – opening and closing a jar. The pump delivery system keeps air out. So your vitamin C stays protected and able to protect you. I have a friend who likes to store her serum in the refrigerator. This isn’t necessary to protect it, but if you enjoy cold applications, this is something you may want to try. Try applying it while you wait for your morning coffee or tea to brew. It’s the perfect combination to get you ready to face the day!